Background: The atraumatic fixation of meshes by fibrin sealant (FS) has been established for both open and laparoscopic techniques of hernia repair. 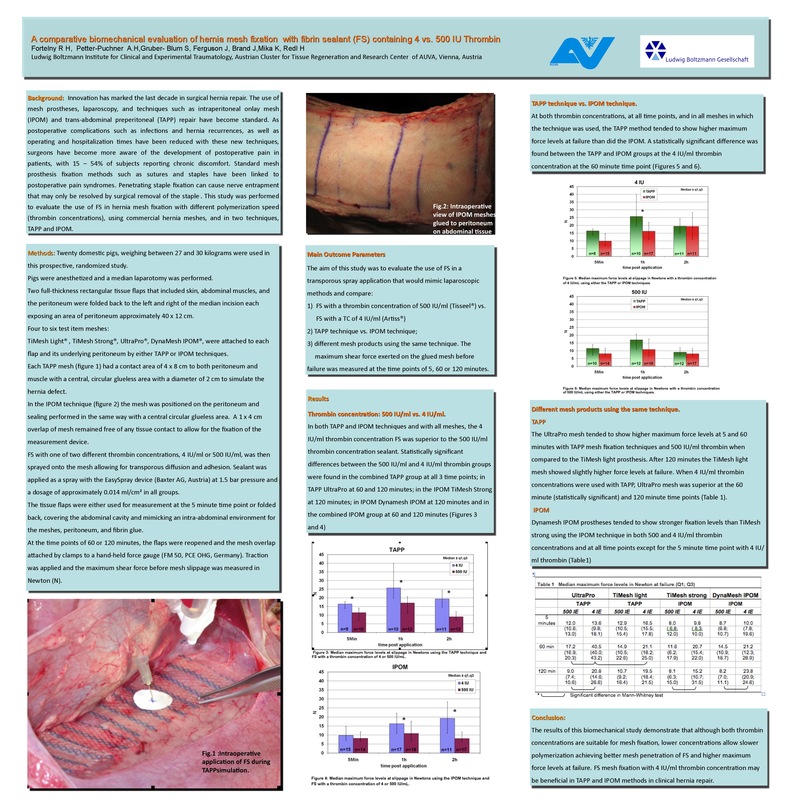 This study was performed to evaluate the use of FS in hernia mesh fixation with different polymerization speed (thrombin concentrations), using commercial hernia meshes, and in two techniques, TAPP and IPOM. Methods: A median laparotomy was performed in a pig model and hernia meshes were placed in IPOM and TAPP techniques. After mesh fixation with FS using thrombin concentrations of 4 and 500 IU/ml, maximum shear force before failure of the fixation device was measured at 5, 60 and 120 minutes. Results: At both thrombin concentrations and in all meshes in which the technique was used, the TAPP method tended to show higher maximum force levels at failure opposed to the IPOM method. In both TAPP and IPOM techniques and in all meshes, the 4 IU/ml thrombin concentration FS was superior to the 500 IU/ml thrombin concentration sealant. Conclusion: Although both thrombin concentrations are suitable for mesh fixation, lower concentrations allow slower polymerization and better sealant diffusion leading to higher maximum force levels at failure. The TAPP method was biomechanically superior to the IPOM method. There were no major differences between mesh products.